I’ve heard that it’s GOOD luck when a bird poops on you. Maybe, but I sure didn’t think so a few nights ago. I’d gone to our symphonic band’s dress rehearsal, the final one before our end-of-the-year concert, and parked in what I thought was a great spot. Close to the door because it was cold outside, in a lighted area because it was night, and near the campus police department for safety reasons. Don’t laugh. Who’s dumb enough to park a mile away from where they need to be and take a chance on somebody jumping you?? Anyway. After practice, I came outside and heard a terrible raucus. It sounded like banshees. Or dozens of college kids celebrating the end of the semester a little early. Looking around, I could see that wasn’t the case. Nobody was there, but the screeching continued. Then I glanced up at the immense pines beneath which my car was tucked. And realized what was making the commotion. And with birds comes poop. All over my car — roof, windows, sides, trunk, doors. Trust me, it was a sight for sore eyes. Such a nasty mess, in fact, that I didn’t even want to touch the door handle to let myself in. And I was mortified driving home in the poop-mobile (despite the darkness outside). The next day, I slunk over to the automatic car wash and ran it through. But soap and water didn’t clean all the filth, and I ended up pressure-washing it myself. Now, I’m all set for the good luck. This entry was posted in Uncategorized and tagged band concert, bird poop, good luck, parking, superstition. Bookmark the permalink. I had to laugh. We have some of our own rules, too: like, don’t park beneath a mulberry tree that’s dripping with fruit. Of course, we also have the “fly-bys” to deal with. Park in a completely open area, with the closest tree a block away, and a seagull on the move who suddenly decides to ‘move’ in a different way can leave a result that looks just like your car. I hope you get your luck. I’ve never heard that once before. The next time a seagull or some grackles visit me, I’ll have to pay attention. I’m glad you found it funny, Linda. I sure didn’t. In fact, if it hadn’t been so late, I’d have washed my car before heading home. The last thing I need is a new paint job on an already new car, ha! Well — my laugh was in rueful recognition as much as true amusement. I don’t know this for sure, but I was told by the guys at my carwash that the new paints they use on cars today are more resistant to insults like this. They say that the love bugs are much more of a problem — they do need to be removed as soon as possible, lest they become paint-pitters! Oh, I remember those love bugs! They really can cake on one’s front grill, can’t they? Good to know about the new paint — thanks! HeeHee, my fingers get twisted up, too, especially on smaller devices. I knew what you meant anyway! Well, one should have some compensation for the aggravation, right?! Sounds foul. Perhaps birds/bats are your totem feathered friends. Which would explain why they are attracted to you. I’m not sure that is helpful. A pack of crows is pretty amazing but it seems they should have been tucked in for the night. Annual Christmas party? May the luck be with you. Foul, indeed!! I guess the only “blessing” was the absence of odor, huh? Perhaps I should’ve done a quick video of the outside of my car so you could get the full effect of the mess. I’d have thought the feathered critters would have been tucked in for the evening, too. Maybe they ‘got me’ just as dusk was nearing; it’s only that I walked outside in the total dark. Debbie, doesn’t it amazing you how tough it is to remove bird doo-doo from your car? And good for you for removing it immediately because that stuff can literally eat the paint off your car. I had that happen to me (several times) when I lived in Florida and still had a car. Funny you mentioned “Expecting Some Good Luck” because while walking through Central Park two weeks ago when I was in NYC, I noticed that a bird had POOPED on my coat while walking under a tree. My coat is black, so you could obviously see it. It looked disgusting. As soon as I found a Starbucks, I walked into their public restroom and washed it off. 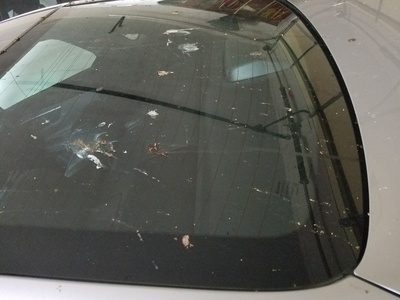 Later, I though…”Oh, that’s right, bird poop means good luck! ” Ha! As Katybeth said in her comment, I’m surprised crows were flying about after dark. We live between two small lakes, one actually a pond. We are in the direct flight path of at least one blue heron and a whole bunch of geese. Sometimes we have a very large and very long white stripe up the center of our car….from hood to headlight. I’ve never actually SEEN this happen, it’s always just there. Like a gift. I guess I should be glad I’m not standing in the driveway at the moment of the gift presentation. Yes, and be glad Katie’s not getting that gift-stripe every day! Ha ha ha Even though I know getting rid of that mess was no laughing matter, I sure had a good chuckle reading about it. 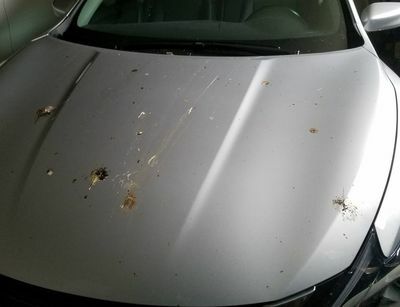 I have never heard that bird poo on your car brings good luck, but hope it is true for you. Oh, I hope so, too, Pat — all of us can use a streak of good luck now and then!